The following is a reference / historical listing of the 70-millimeter presentations of “The Road Warrior” in North America. 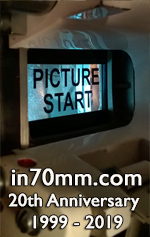 The film’s 70mm prints consisted of full-frame imagery blown up from anamorphic 35mm photography. The audio was Six-Track Dolby Stereo (“A” encoded “baby boom” format). “The Road Warrior” (aka “Mad Max II”) was among eighteen confirmed first-run films released in 1982 with 70mm prints for selected engagements. Three 70mm prints of the film were reportedly struck for distribution in North America. The Kennedy-Miller production and Warner Bros. release — directed by George Miller and starring Mel Gibson — opened in limited release on May 21st and expanded in the weeks that followed. The film originally premiered in Australia in 1981. The U.S. premiere (presumably in 35mm) was held April 27th & 28th, 1982, at the Festival Theatre in New York during the “New Directors/New Films” series.